The book Atlantico Frío. Redes transnacionales del arte y la política en los tiempos del Telón de Acero (Cold Atlantic. Transnational networks of art and politics in the times of the Iron Curtain), edited by Paula Barreiro López and published by Brumaria editions (Madrid), has just been released. The volume is the result of a collective research work developed over the last three years within the framework of MoDe(s) project. The collected contributions seek to emphasize forms of mediation, dissent and resistance to the Cold War’s ideological and aesthetic schism. Based on case studies and documentary sources so far unpublished, the texts contribute to the discipline of art history by articulating stories that, from decolonial, post-colonial, feminist and cultural perspectives, understand the Cold War as an epistemological system in itself, not as a mere context. With this approach, this book seeks to contribute to a new cartography of artistic practices through the lens of their collaboration (and tension) with political practices. Seeking to question the historiographic constructions of the Cold War and to encourage their reconstruction thanks to a connected study of the global South, the book proposes to delve into their ramifications in the European and North American artistic field, across the Atlantic. The Atlantic is presented as a complex unit of analysis that fosters a transnational view, focused on mobility and flows that sustained political and cultural relations, encounters, migrations and diasporas of agents, practices and objects. Talking about a Cold Atlantic is a way of thinking about a real and imagined space in which, during a specific historical period, identities were negotiated, hegemonic racial and cultural policies were exercised, but also productive syncretisms and shared knowledge arose, and alternative models of coexistence and relationships were shaped against the dominant geopolitical order of the Cold War. In this context, the Spanish State occupies a historical and cultural position, with a triangular relation with the European, African and American continents; it is a decentralized position, crossed by multiple vectors. The practices and exchanges established within this shared socio-political and cultural space have to be re-evaluated and made visible ; in fact, a very scarce literature has been so far published about this issue, especially in relation to exchanges between nation-states. So far, cosmopolitan modernities have not been subject to extensive research and publication, especially from transversal perspectives that problematize critical, aesthetic and political debates in the heat of Cold War’s global conflict. Nevertheless, besides taking the above-mentioned tricontinental dimension as a point of departure, this book also explores circuits of exchange between art produced in the atlantic axis and the Eastern block, as well as countries from the non-aligned movement. 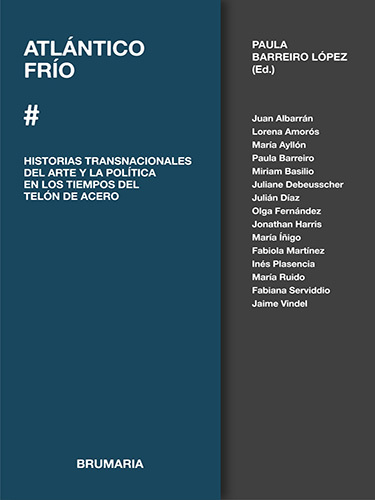 The book is structured in four blocks that analyze the violence of the colonial legacy and its imprint on cultural productions (Legados coloniales: control, cuerpo y visualidad), the configuration of a tricontinental front that fuelled the artistic and critical practices of the sixties and seventies (El desafío tricontinental), the role that institutions and disciplines had in the configuration of the different cultural imaginaries of the period (Políticas y discursos en el espacio institucional) and, finally, the participation of artistic practices in transnational platforms that constructed the global geopolitics ((Geo)políticas culturales transnacionales: local y global). While these four angles of analysis determine the structure of the volume, other transversal axes connect the chapters to each other in different ways, showing that this is one possible organization among many other latent ones.